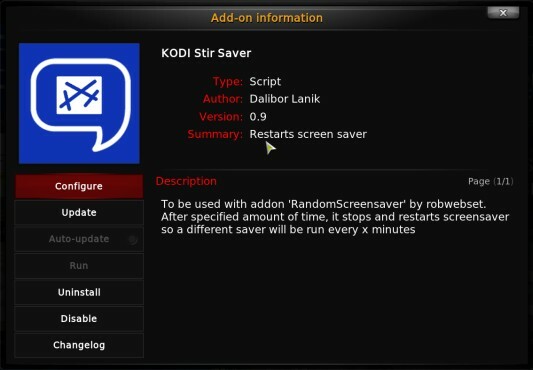 This addon for Kodi works only (or is useful) only if you are using another addon: RandomScreenSaver by robwebset. RandomScreenSaver displays screensavers in random order, so you can use several screen savers, if you don't want to use only one. The thing is, it switches the saver only on saver start. That means that if your saver is running for 40 minutes, you will be seeing the same saver all 40 minutes. 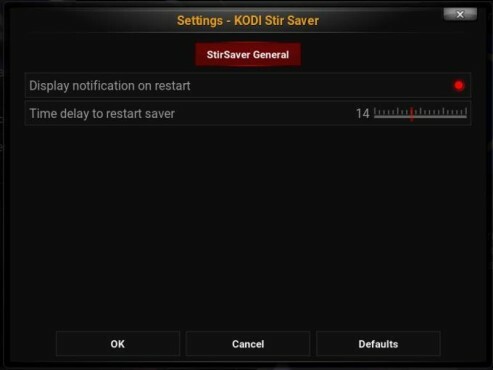 Stir Saver to the rescue! This addon termnates the saver after specified amount of time (i.e. 10 minutes) and runs the screensaver again. So the RandomScreenSaver then picks (most probably) another saver and runs it. That way you will see more than one screen saver in one "session". The only thing you need to set is the timeout (in minutes) when to restart the screen saver. It is possible you will see the same saver all over again - because RandomScreenSaver chooses the screen saver randomly, but chances are that you'll, if your saver session is long enough (and timeout short enough) will see several screen savers. Just set it to i.e. 5 minutes and the chances are that every 5 minutes, your saver will restart and be replaced with another one (also depends how much screen savers you are using - the more you use the better are your chances for a different saver). If you don't have RandomScreenSaver installed, nothing will happen except your saver will restart and resume every x minutes. In order to install it, first install my REPO. Then install add-on, no configuration needed.